In a cold skillet place chopped garlic and chili flakes. Add oil and butter. Turn stove to medium-low heat to let the garlic & chilis infuse with the oil. While the garlic is "simmering" in the oil, cut grape tomotoes into halves and quarters depending on size. Place in oil, carefully so you don't splash. Increase heat to medium and let simmer until tomatoes start to burst open. (While tomatoes are cooking, chop your basil.) Increase to medium-high heat and add shrimp, salt and pepper. Sautè shrimp until almost done and then add chopped basil. Drain pasta add to shrimp and toss to coat. Serves 2 but can be easily adjusted for more. This is a fluid recipe, you can add a bit more or less oil to your prefrences, I don't really measure! Preheat oven to 350º F (175 degrees C). Lightly grease a 9x5 inch loaf pan. In a large bowl, combine flour, baking soda and salt. In a separate bowl, cream together butter and brown sugar. (Add vanilla) Stir in eggs and mashed bananas until well blended. Stir banana mixture into flour mixture; stir just to moisten. (Add walnuts and stir) Pour batter into prepared loaf pan. Cook onion and green pepper in 2 tbsp of butter until tender. Combine onion mixture in a bowl with chicken and chili peppers; set aside. Fill each tortilla with 1/4 cup of chicken mixture, roll up and arrange in a baking dish. Pour remaining sauce over enchiladas and sprinkle with remaining cheese. Recipe as printed should make 12 Enchiladas. This recipe is easy to double or even triple. This is a good casserole to make in Foil Baking Dishes and freeze for later. Like I said before, I doubled the recipe when I made it tonight. This recipe isn't hard to make, but it is a bit time consuming, especially if you double/triple it. But it is SO worth it! Peel about half the potatoes. Cube all the potatoes. (Next time I'll cube the potatoes into smaller pieces, this time I just cut them into quarters.) 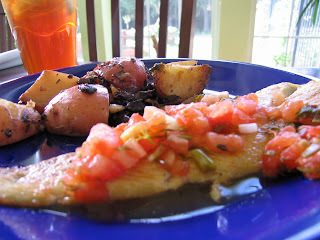 Heat the olive oil in a large heavy-based saute pan and saute the potatoes until they begin to turn a bit brown. Add in shallots and whole garlic cloves and continue to saute until golden. Add olives and season with salt and pepper. (Careful, the olives will be salty). Add about 1/4 cup of water, cover and cook on low heat for 10 minutes. Uncover the pan and add herbs, stirring to mix well. Add a bit more water if needed and simmer until potatoes are soft and almost fall to pieces. Water should be cooked away at this point. NOTES: If you are going to use dried herbs for this recipe instead of fresh, use less. I'd say about 1 teaspoon of each. The original recipe called for 7 ounces of olives. Instead of the canned pitted black olives I usually have on hand, I used unpitted greek black olives and pitted them before adding them to the pan. These have (to me) a much stronger flavor and so I used much less. So consider the type and taste of the olives you use and adjust accordingly. This is one of those easy 30 minute or less one skillet dinners. I usually have the ingredients on hand and it's great for those busy nights. Cut potato into 1/2 inch thick moons. Try to make them all the same size so they cook at the same rate. Pour Olive Oil in a very large non-stick skillet on med-high heat. Add potatoes. Dice bell pepper and onion into 1" pieces and add to potatoes. Stir every few minutes. 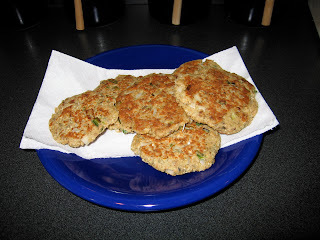 Chop sausage into rounds and add to skillet. Add seasonings: worcestershire sauce, thyme, salt and pepper and garlic seasoning. Let cook for 20-25 minutes stirring occasionally. Making sure to flip potatoes over. When sausage is cooked and potatoes are easily pierced with a fork, it's done. Sorry it's been a long time for a new recipe. Things have been very busy this summer! I've been actually going back and cooking some of my recipes that are already posted here, so I haven't been cooking "new" things this past week. I had one flub, that I didn't dare post! I have a yummy Chicken Enchilada recipe that you can look forward to in the next couple of days. In the mean time you can check out what I've been up to by following my family blog at www.txtwins.blogspot.com. I hope everyone is having a fun filled summer too! Drain salmon. Crumble with fork. Combine all ingredients. 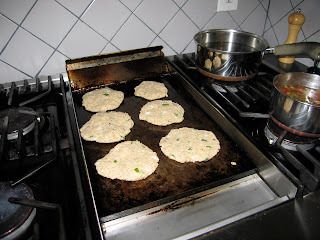 Shape into 6 - 8 round patties. Pan-fry on both sides in oil until golden brown. I usually do mine on my griddle. Serve with cocktail or tartar sauce. I have to admit, the following "recipe" is more of a dinner suggestion, or idea and much less of a recipe. The simple fact is that I'm not sure how long I cooked the fish. I started to bake it at 350º but then noticed it was not browning, so I bumped up the temp to 425º. That wasn't working either. So, I put it on the top rack, turned on the broiler and finally got the correct results. I wanted a crispy oven "fried" fish. I think my problem was I used frozen fish that I defrosted. It was too water logged (even after blotting with a paper towel.) If I try this meal again (and it ended up being tasty so I probably will!) I'll use fresh fish. I still want to write it down, because it is a good idea, and that's what my blog is mostly about. In a small bowl, whisk egg, milk and some salt and pepper. In a food processor (or magic bullet!) pulse oatmeal a few times to grind it to smaller pieces. Mix it in a bowl with the flour, seasoning and salt and pepper. Pat fish dry. Place in egg mixture, let it drip off, place in flour mixture. Cover, and dust off excess. Repeat for a double coating. Place on a cookie sheet that you spray with cooking spray. Repeat with second fillet. Spray both fillets with cooking spray and broil(?) until the fish is browned and flaking apart. Put on bun with tartar sauce. Serves 2. In a large bowl, combine: wheat flour, wheat germ, oats, baking powder and cinnamon. Stir. Mince fruit. Add to dry ingredients and distribute evenly. In a smaller bowl, mix wet ingredients: applesauce, honey, egg and vanilla. Add to dry ingredients and stir until well mixed. Scoop out tablespoon size mounds and flat with thumb. Bake at 375º for 10 min. Dust with powdered sugar if desired. Remember, if you child is under one year, they cannot eat honey or egg whites. Refrigerate these cookies because wheat germ spoils easily. My nod to the 4th of July. A red white and blue no-bake cheesecake. For those that know me, they know I can't bake. But anyone can make this easy cheesecake! In a large bowl beat cream cheese, sour cream and sugar together. Add vanilla and whip cream. Beat on high until all the lumps are out. Pour into crust and set in refridgerator for 4 hours. Garnish with your fruit of choice. Today was a pre-4th of July celebration for my family. I guess. Either that or they were just coming to visit for the long weekend. Anyway, they all came to my house and I made steak fajitas. There really isn't much of a recipe, but perhaps if you are from up north, you may not know about this most delicious Tex-Mex creation. Marinade steak in the marinade overnight if possible. Slice onions and bell peppers into long strips. Set your largest skillet to high. Remember to turn on your vent fan. Add a touch of oil and the bell peppers. Stiring frequently (and adjusting heat as needed) cook until they start to wilt and blacken in spots. This takes patience at least 10-12 minutes. Salt and pepper as you are stirring. Set the peppers aside and do the same for the onions. Cover with foil to keep hot. Preheat outdoor grill to as hot as possible. If you are using charcoal (lucky you!) get your brickets close to the grill top as possible and wait for them to get really hot. Cook your steak about 6 minutes a side. It should start to blacken in parts. Let rest for about 15 minutes. This is HUGELY important or your steak will be dry and tough. It will be a long piece of meat about 5 inches by say 10-12 inches long. Cut the steak into about 3 pieces so 5 inches by 4 inches (for example). Then turn your meat and cut at an angle against the grain. This also helps keep it tender. Serve in a tortilla with cheese, sour cream, salsa, chopped avocados. OK, so I forgot to take a photo of it all plated pretty. I did manage to get one before we went back for seconds. I’ve been gardening lately. Let me tell you a secret. When you grow a vegetable from a seed you have a different relationship with your food. Babying it as a seedling, holding your breath as you transplant hoping you won’t damage the roots, watching out for pests, watering and weeding. Well, let’s just say you get a little attached. And so when it finally blooms and sets fruit you get a little excited. Then you still must continue to water and weed and harvest in temperatures around 105 gazillion degrees… when you do have a harvest you DO NOT waste. A carrot I bought at Krogers may shrivel up and mummify in my fridge but a carrot from my garden WILL be eaten. This recipe was a very successful attempt at finding a way to like eggplant other than fried. Why did I grow eggplant if I don’t particularly like it except fried? Well, because I do like them fried. The problem was I bought a “gourmet mix” which had four different types of eggplant seeds all mixed together. Of course I wanted to try one of each so I planted a bunch of the seeds hoping to get at least one plant of each type and that means way more eggplant than I originally planned on. So far, I have had Purple Blush and Snowy White eggplants. The purple blush is much milder and to me much better than the standard big blackish purple eggplants I usually see at the store. Please note that not only did the eggplant come from my garden, but so did the green onions, and the herbs; the thyme, sage and the basil. My basil was blooming so I cooked with the blooms. This photo shows most of the ingredients I used. Except for the shrimp. And the wine. Mostly it is a not so subtle method of showing off my beautiful garden produce. Scoop out the flesh of the eggplant, chop, and reserve. Coat shells with olive oil, and season with salt and pepper; set aside. Heat 1/4 cup olive oil in a medium skillet over medium high heat. Sauté onion, bell pepper, garlic, basil, thyme and sage until wilted. Stir in the reserved chopped eggplant. Season with salt and pepper. Sauté until eggplant begins to turn golden in spots. Pour in wine, and cook 5 minutes. Transfer to a large bowl, and mix in the bread crumbs and chopped shrimp. If mixture is dry, stir in more olive oil. 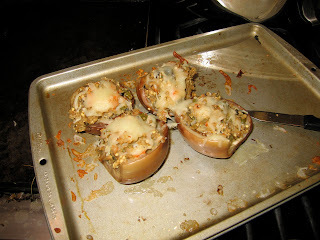 Stuff mixture into eggplant shells. Bake in preheated oven for 30 to 40 minutes, or until eggplant is tender. Sprinkle mozzarella cheese on top and return to oven just long enough to melt cheese. Serve with a fresh green salad and you’re all set. 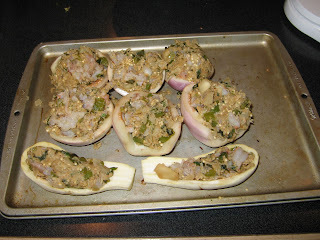 Here's a photo of the eggplant stuffed before they went in the oven. Because my eggplants were a bit small, I had more stuffing than space so I went to the garden and harvested a Snowy White eggplant to use for the last of it. You might remember a couple of weeks ago I had a finger paint party at my house. After the fun of painting, we all came in to cool down and had a picnic on my kitchen floor. Some kids were at the table, some were in high chairs, and some were on the floor. There were lots of kids! Anyway, it was a bring your own food type of picnic. My friend Kara brought peanut butter balls for her kids. I had to have the recipe! They are so yummy! Mix everything together and scoop into balls with a small ice cream scoop/melon baller. Refrigerate and then enjoy! These were the ingredients I used.